This 2-hours walking tour leads you to discover a perfectly preserved ancient Roman city, OSTIA, just a few steps from the capital. The route allows you to know customs and traditions of the ancient Romans, thanks to the information provided by the archaeological remains. 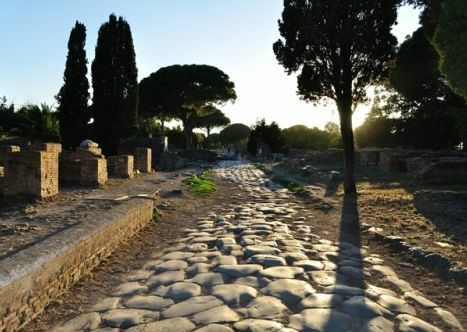 walking along the main street, the Via Ostiensis, we get to the East gate of the ancient Roman colony founded according to historians by king Ancus Martius in 616 B.C. Before entering the gate called Porta Romana you’ll see the cemetery outside the settlement. The tombs allow you to deepen the knowledge of the funerary rituals between the Republican and Imperial period. Once inside the defensive walls of the city you walk along the main street called Decumanus Maximus, flanked by shops (“tabernae” in Latin); then you visit the Baths of Neptune, where the vast gym, the frigidarium and the calidarium decorated with wonderful mosaic floors are still visible. Next stop is the Theatre, built by the emperor Augustus and restored by Commodus; sitting on the original seats of the cavea you’ll listen to interesting stories about ancient Roman comedies. From this time on, the walking tour heads to the Piazzale delle Corporazioni, the Forum, the Thermopolium (ancient fast food), discovering a world away in time but on many points of view very similar to the modern world. The archaeological park is well organized, away from the hustle and traffic of the city, with a restaurant, toilets, bookshop, and a beautiful picnic area. Meet the tour guide in front of the ticket office, Viale dei Romagnoli 717, Ostia antica - RM – subway Line Ostia Lido, Stop at OSTIA ANTICA. Fee per person including ticket plus tour guide euro 48; euro 33 under 18 years of age. Pay cash directly to our guide that will hold a board ROMOLO E REMO. For more information or to book, call 0692939974; 0766840578; mob. 3281640180, or e-mail to segreteria@romoloeremo.com. This WALKING TOUR is highly recommended for families with children. Wheelchairs are not allowed because of the bad conditions of the original Roman streets.